As the city of Chennai is considered of significant importance in glorious past of India, there are numerous historic structures that today serve as important landmark in the city. As the city experiences huge footfall from all across the world, there are numerous luxury golf resorts that are acclaimed for providing excellent accommodation complemented with exceptional services. These resorts are regarded as ideal accommodation option for tourists wanting to instill the element of royalty by indulging into the luxury game of golf. Additionally, the interiors, exteriors, plush rooms, ultra modern amenities and Indian hospitality are a few inseparable elements of luxury at the Golf resorts near Chennai. 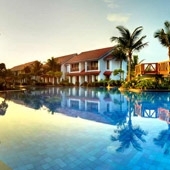 Radisson Blu Resort Temple Bay has 144 guest rooms and villas, beautifully decorated. Some of the rooms also feature private pools. The resort has nine-hole mini golf course, which is an ideal place for golf enthusiasts.